Feeling bored and stale with your own guitar playing is very common and something that everybody who has played guitar for at least a few years has felt before. You know the feeling, you pick up your guitar to play and all that comes out is the same old stuff that you always do, sounding the same old way. This can certainly be frustrating, however it doesn’t have to be. With all the different techniques, elements and innovative tools to do with acoustic guitar playing, that are readily available for you out there, it’s never been easier to get yourself out of these ruts that guitarists often find themselves in. In part 1 of this article I am going to present to you two cool ways you can play your acoustic guitar to get those creative juices flowing again. In part 2, that will follow shortly, I’ll give you a further three unique ways you can approach your acoustic guitar playing. There have been times over the years of playing guitar that I have felt uninspired and unmotivated with my playing. I would feel very stale and like I was trending water rather than making progress with playing. However what I found was that by being open to other styles of guitar and studying players I had not really heard before really reignited my creativity on the guitar. There are many elements and techniques from other styles that you can bring into your own playing that will complement what you can already do and literally set your guitar creativity on fire! There have been many times that my acoustic guitar has felt like a totally new instrument to me when I have done this, even though I have been playing for many years. In fact, I strive to integrate new elements and techniques into my playing everyday in small ways because I see my guitar playing as something that continually evolves. It never stops, if it does, then I do too, and I don't want that and neither should you. If you ignore the signs of your playing getting stale and feelings of being bored with it all, then the likely scenario is that you will quit altogether. I am sure if you are reading this article, that is the last thing you want. As I mentioned before, you need to view your acoustic guitar playing as something that continually evolves and improves in small ways everyday. This is what keeps you engaged with your instrument and keeps your creativity on the guitar going in an upward trend. To be clear, when I talk about your guitar playing evolving by discovering new techniques and approaches, I am not referring to surfing the internet always looking for new “stuff” to play. Jumping from one thing to another, learning a little bit of this and a little bit of that, with no strategy in place, will do very little for you. I am wanting to bring lasting change to your guitar playing by getting you to invest time into creative ways of approaching the instrument and in turn massively increasing your desire, inspiration, and motivation! The following ideas and approaches are just to get you started. I want to make you aware of them, if you are not already, and also encourage you to follow through and explore the ones you like further. To cover any in detail is way beyond the scope of this article. I could literally write hundreds of pages on any one of the topics we will cover in both parts 1 and 2 of this article on creative guitar playing. So for now let me just introduce you to these approaches, as well as include a few ideas on what to do to get you creating with them on your guitar now. There is nothing quite like the sound of harmonics in your acoustic guitar playing. Your creativity level using these alone will sky rocket! It is truly amazing what you can do with these when you really get into them and study players who have taken them to completely new levels themselves. In a nutshell, a harmonic is sounded by lightly touching a vibrating string at specific points along its length. In regard to your acoustic guitar playing and increasing your creativity, lets look at the octave harmonic. To get this you simply touch the string as it is vibrating, with your picking hand, exactly 12 frets higher from where you sounded the note. 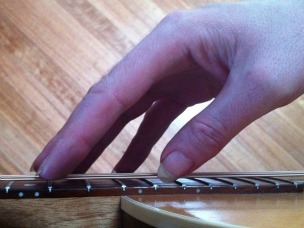 You must touch the string directly over the fret itself, not in between as you would normally do. As you can see, I am using my index finger to touch the string while my thumb plucks the string itself from behind sounding a "bell" like harmonic. This sounds great over an Em chord, or the key of Em in general. However you don't need to stop there. You can sound harmonics from any fretted note you like. Just be sure to place your index finger exactly 12 frets higher from where you are sounding your note. Above, I am using harmonics to sound out a G major scale. I just need to make sure that I am placing my index finger exactly 12 frets above the note I am sounding at the time indicated in the brackets. You need to basically visualize the scale shape an octave higher, where you are sounding the harmonics, while fretting it out an octave lower with your fretting hand. - Take the G scale from above right now and sound it with harmonics over a backing track in the same key. Mix the notes/harmonics up and you will be creating a really cool and unique sound on your acoustic guitar instantly. - Take an existing melody you know in G Major and sound it out with harmonics. This is also a great way to start getting this technique into your own guitar playing. - Watch the video below to learn all about harp harmonics and how to get these into your guitar playing. The results are truley breathtaking! Harp harmonics are definitely a game changer for your guitar playing. While they are certainly evident in the styles of various players such as Tommy Emmanuel, Chet Atkins, and Lenny Breau, they are still an under utilised technique over all. Trust me, you will most definitely turn heads when you use harp harmonics in your own playing. We are however still just touching the tip of the iceberg with this technique. There are many more amazing things you can do with harp harmonics. While standard tuning is exactly that, standard, and the most common tuning used with guitar, there are many open and alternate turnings for your acoustic guitar playing you should consider exploring. Open and alternate turnings will make your acoustic feel like a totally new instrument to you in a good way. It won't feel "new" like your guitar did when you first started playing it and you were totally clueless. Instead, alternate tunings will reignite your creativity on your guitar, as things that were at the very least difficult and a lot of the times impossible in standard tuning, become not only possible but very easy to do in an open or alternate tuning. It is a good idea to spend some time in one open or alternate tuning before moving on to another. This way you can get familiar with its nuances and character without getting it mixed up with another tuning. Open G Tuning (D G D G B D): Great for slide playing on your acoustic guitar. The 2nd, 3rd, and 4th strings are unchanged from standard tuning so it is still somewhat familiar but different at the same time. Even though I am only targeting the strings that haven’t changed in the examples above (ie. 2nd, 3rd, and 4th strings), you should still hear the over tones of the other strings when using a slide. This adds to the over all sound. DADGAD Tuning (D A D G A D): A very popular tuning known as "DADGAD" in reference to the open string notes. This tuning creates a Dsus4 sound and is great for open and moveable chord shapes on your acoustic guitar. Notice the rich sound you can get by holding and moving a single chord form mostly made up with open strings. Csus2 Tuning (C G C G C D): This tuning creates an open Csus2 chord, hence its name. This is a very symmetrical tuning and allows you to play runs and melodies in different octaves across the strings without really having to change position. Don’t delay. Start with either of the techniques I have presented you with today. It doesn’t matter which you go with, it only matters that you begin now. Take your time, be patient, and enjoy expanding and evolving your guitar playing. It’s times like these you lay the foundation for massive improvement and growth as a guitar player and musician, so get excited!